Opening hours: Large shops and department stores are open between 9.30 a.m. and 8 p.m. from Monday to Saturday. All shops, with the exception of small souvenir shops, are closed on Sunday. Dominating the city skyline, you can’t fail to notice it: the Kaiserburg. At the time of the Holy Roman Empire, the castle was occasionally home to each of the emperors, and in the Middle Ages, it was one of the most important royal palaces. The sights here include the new castle museum, the palace with the emperor’s living quarters, the Romanesque Double Chapel, the Deep Well and the Sinwell Tower. The neighbouring garden is a must-see too. It might be small, but it’s a welcome contrast to the hustle and bustle of the city and is popular with residents too. The castle's garden is open from April to October. 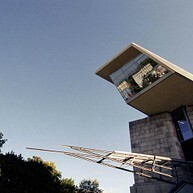 The Albrecht-Dürer-Haus is one of the most famous museums and exhibitions in Nuremberg. 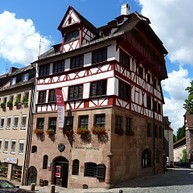 Between 1509 and 1528, it was Albrecht Dürer’s home and workplace. Today, the building is both a memorial and a museum. The rooms feature period furnishings, and visitors can see a demonstration of the printing procedure used in Dürer’s lifetime in one of the bedrooms. The top floor, meanwhile, showcases copies of the artist’s works. The museum houses a variety of temporary exhibitions featuring original works. We highly recommend taking the guided tour with Agnes Dürer, wife of the famous artist. She gives a faithful account of what life was like 500 years ago. Even today, the former Reichsparteitagsgelände (Nazi Party Rally Grounds) in the south of the city is still home to gigantic ruins representing the Nazi regime’s deluded notion of grandeur. The 11 km² complex was where the Nazi Party orchestrated its propaganda campaign. The documentation centre is located in the north wing of the Kongresshalle, which was designed by the Nazis to hold 50 000 people and was never completed. The permanent “Faszination und Gewalt” (“Fascination and Terror”) exhibition housed in the 1300 m² venue, chronicles the causes, relationships and consequences of the Nazi dictatorship. 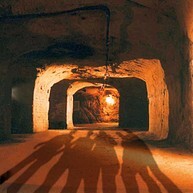 An extensive labyrinth of underground passageways and cellar vaults has existed in the bedrock of castle hill for centuries - the Historic Rock-Cut Cellars. 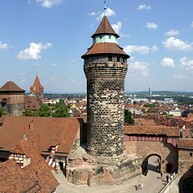 As early as 1380 red beer was stored in the subterranean cellars, sometimes comprising four levels, that had been cut into the Burgsandstein (local Nuremberg sandstone). During the air raids of World War II many citizens found shelter in these historical vaults. 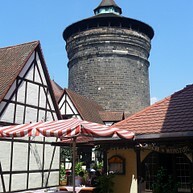 Reservations and Meeting Point: Brewery Shop Tours are offered in German. English Audio-Guides are available. The large market square located at the heart of the city centre is surrounded by a multitude of must-see sights. The daily market takes place here too, where you can buy all sorts of tasty treats, flowers and spices. The ornate Beautiful Fountain is a well-photographed sight. The two rings on the fence are the focus of much attention. A legend says that if you turn the “golden ring” and make a wish, it will come true. The black ring, meanwhile, is said to bless women with children. The main market square is characterised by the facade of the Chruch of Our Lady constructed as an imperial royal chapel. Every day at noon the "Männleinlaufen" (mechanical clock and glockenspiel) takes place here - a daily event not to be missed! The Memorium Nuremberg Trials is a permanent exhibition. It informs visitors about the background, progression and repercussions of the Nuremberg Trials at the original location where they were held. Audio guides in various languages are available. Guided tours of the Memorium Nuremberg Trials are available for individual visitors at weekends. The "Germanisches Nationalmuseum" is one of the largest museums of German art and culture in the world. The exhibitions take you on an exciting journey through time, showcasing hand axes from the Stone Age, the Ezelsdorf Golden Cone, medieval sculptures, the oldest globe in the world, paintings by Albrecht Dürer, baroque masterpieces and contemporary art. Other rooms feature textiles, clothes, jewellery, stained glass, handicraft, furniture and much more. The GNM is also home to the largest library of German art and culture, with more than 650 000 books. 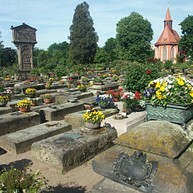 The Friedhof St. Johannis is one of Europe’s most important cemeteries, as a number of famous personalities, such as Albrecht Dürer and Veith Stoss, are buried here. A very beautiful place, it is also known as the “Cemetery of Roses” as a result of the many roses that grow on the site. The cemetery was commissioned as a result of the advanced council order that no longer permitted burials to be performed within the city walls. A new cemetery therefore had to be built in the surrounding area for the northern part of the city. Why not visit the baroque Hesperidengärten afterwards? Whoever has experienced the wide variety and idylls of Nuremberg Zoo will come back again. The elegant movements of the dolphins and sea lions in the dolphin lagoon, the tropical atmosphere in the manatee house and the feeding of the polar bears in the Aqua Park provide an unforgettable experience. 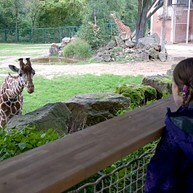 Young visitors have time to stroke and feed the animals in the children's zoo and run around in the huge playground. Since the 2012 Easter holidays the popular "Kleine Adler" has been running again , a true to scale 1:2 replica of the first ever German steam locomotive. The more than 2 kilometre-long track runs along the giraffe enclosure, below and past the dolphin lagoon to the children's zoo and back again. 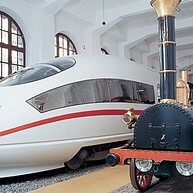 The heart of the museum is an exhibition landscape on the history of the railway in Germany. The walking tour - over 2,500 sqm on two stories - covers two centuries, including all their technological and economic, political and cultural aspects. A sight with special flair. Situated at the heart of the city and surrounded by the towers and walls of the medieval fortifications, from the middle of March till the end of December the Handwerkerhof invites visitors to discover a wealth of experiences. The “little city at the Königstor” (King’s gate) opposite the Hauptbahnhof offers both traditional crafts and Franconian hospitality in charming surroundings. Why not round off your visit by trying some hearty specialties, washed down with a fresh Nuremberg beer or Franconian wine, in one of the cosy restaurants. Nuremberg’s oldest town church St. Sebald dates back to approx. the year 1215. The church is located underneath the Imperial Castle and contains important works of art such as the imposing 4.17 meter high tomb built by the artist Peter Vischer - the bones of Nuremberg's patron saint Sebaldus are presumed to rest here. 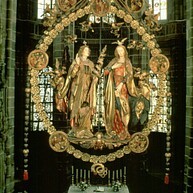 The famous Nuremberg painter Albrecht Dürer was baptized and got married there. Destroyed during World War II, St. Sebald was reconstructed in 1957. The beautiful St. Lawrence Church is tucked away at the heart of the Nuremberg pedestrian area. Built in 1250, it has been an Evangelical Lutheran church since 1525. The church has a magnificent west facade with a splendid portal richly decorated with statuary and a huge rose window (mid 14th century). Reconstruction work on the church started in 1952 following severe damage during the World War II. 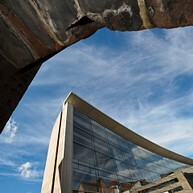 The New Museum - State Museum for Art and Design - with its curved glass facade rises over the medieval city walls in the beginning of Nuremberg's Old Town. The handsome museum has received many awards for its striking modern architecture and is a venue for contemporary art and design.